2. Parkranger Manakin: an android created by an Experimental forestry management A.I. built by an Asuran Genius. The A.I. named Oz was shot into tyria's orbit to manage its forests and animals(the Asuran had an obsession with the sylvari) To better manage its forests the A.I. started building androids to walk tyria's surface and be its eyes and ears...sadly the A.I. now believes itself a god to its(followers/Children) androids. 4. 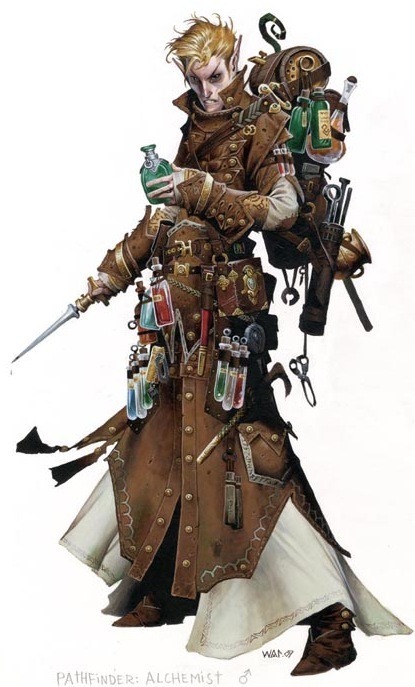 Malachai Margrave:If you've played pathfinder..you know who damiel the alchemist is...basically that's the concept. 1. The bloodstone I was referring to was those new earth gauntlets and boots from the gem store..just chips and pieces. 4.hes just an alchemist..potions and such. I use the elixirs and stuff and grenades to represent it. makes steamtech stuff too. 1. oh, alright, as long as there's a proper backstory and lore for your gauntlets and boots, go for it. also what about the bloodstone eyes? 4. well i'm gonna be biased here mainly because i love alchemy and steam tech, but go for this one. For the first character concept, speaking on terms of credibility, having bloodstone as a human, one should recognize it's severe toxic effects to all life forms and consider the implications of wielding it and harm it could do to others. 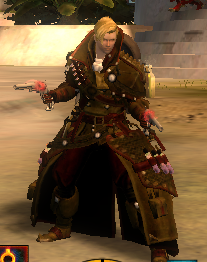 The only people physically changed by bloodstone in gw2 end up being Bloodcrazed and no longer of the right mind. It corrupts and eventually can kill. I think the idea of having glowing eyes to the use of magic can be explained in a sensible way as I've seen other RPers do this. But as far as wings are concerned, many if not most RPers will be wary of one who claims their character have wings as it is not found in the game universe in GW2. A decoration or accessory, sure. Actual wings, unless you are a tengu or harpy, no. The second concept reminds me of the Horizon: Zero Dawn plot. I'm not necessarily against the concept. If you want to play a golem with A.I. themes, perhaps limit the scope to just a small remote corner of Magumma map or another remote area. Better yet, an area that has been previously devastated that needs this effort of rebirth if the function of an asura's project. Certainly not all of Tyria. Not sure on the reference to the barbarian but I presume any barbarian character would be fine. An alchemist would also be a good concept. The last two ideas appear to be the most viable and likely to get you RP in my opinion. Typed this on my phone so sorry for any grammar or spelling mistakes in advance. Have fun RPing in gw2. well I guess ill have to use malachai...im sad I really like manakin...but whatever works..anyway...heres Damiel..